The Santa Eulalia Country Hotel lies in spacious grounds in the village of Chacín, which belongs to the district of Mararicos (La Coruña). It is the house where the famous painter and philosopher, Pedro García Lema, was born. The hotel is situated in a beautiful environment, where rivers and extensive green spaces will encourage you to take a walk and enjoy the natural surroundings. The main building houses the bedrooms, and its style corresponds to the typical cottages in rural Galicia - built of stone, clay and wood. Combined with more modern materials and services, the hotel offers a pleasant and comfortable atmosphere, ideally suited to the traveller's needs. You will feel a warm welcome here and spend really unforgettable moments. Here you will also find a traditional Galician "lareira" (hearth), where you can draw up to the warmth of the fire and read a book from our library, or disappear into any one of the numerous comfortable corners in the hotel. Our restaurant service and the range of activities on offer will make your stay truly enjoyable. Rivers, country lanes, hills, trees and plants. Nature in all its beauty. There are still "carballeiras" (oak woods) where time seems to have stood still. Not too far away are the long, narrow tidal inlets of the Rías Bajas, or Finisterre and the wonderful beaches of Carnota. All these offer a wide choice for excursions. Our establishment will be able to offer advice on the best options available. Please feel free to consult us. No notice of arrival after 8pm pr no-show will be charged with total amount of booking. Cancellation without charge with one week in advance. 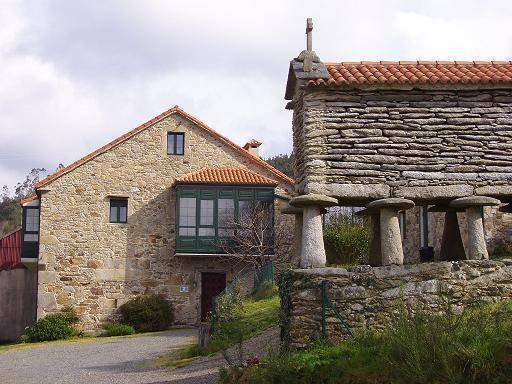 Bus from Santiago and A Coruna to Muros and Finisterre, stop in Pino do Val.